Whilst most permissions are set to either on or off, can access or can not access something, the permissions in relation to viewing and editing Client data are not as straight forward. There are 10 categories of Client Access permissions that can be set against a role, along with four options that effect the addition and viewing of documents, emails, SMS and Phone Call History. These are defined in the table below. * Permissions 4010 is a cut down version of 4007. For Clients that are defined as their Own, the only consultations that can be edited are those that the Practitioner has carried out themselves (e.g. their name is the practitioner against the appointment) but if that Client has had appointments with other practitioners, then they can view those as well. Implicitly grants the practitioner the right to grant access to other practitioners. 2. If the Office has only one practitioner, then that practitioner becomes Primary Practitioner. 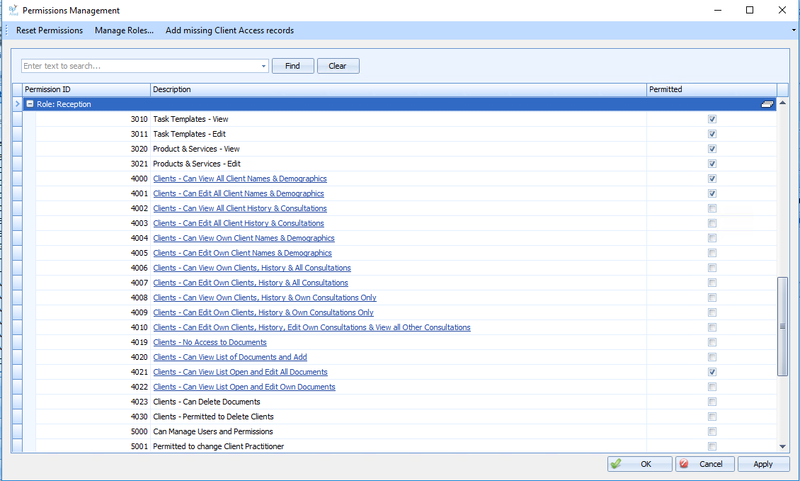 Choosing a permission from the screen will enable any other dependent permissions based on the table above. 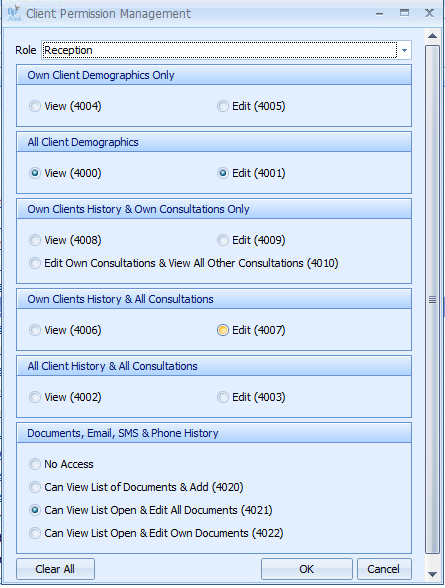 The relevant permissions will be displayed in the Roles permissions list.